Facelift. Lenovo once again offers a device for private and business users with the latest model of the inexpensive ThinkPad E-series. There are some visual changes compared to the predecessors – but you still get a matte panel and a good keyboard. 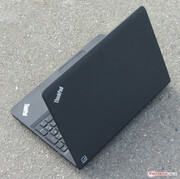 The ThinkPad E555-series is the latest version of Lenovo's entry-level line-up for the business segment. We reviewed several predecessors in the past, including the ThinkPad Edge E525, ThinkPad Edge E535 and ThinkPad Edge E545. 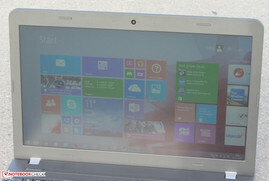 Lenovo waived the "Edge" for the new version. 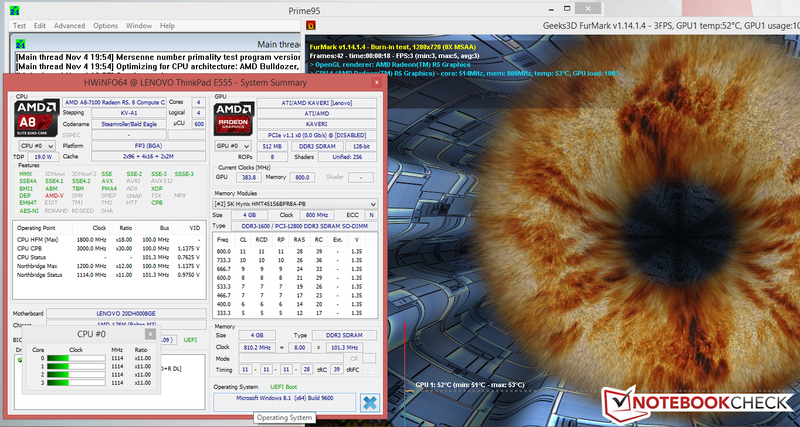 The E555-series once again uses APUs from AMD. 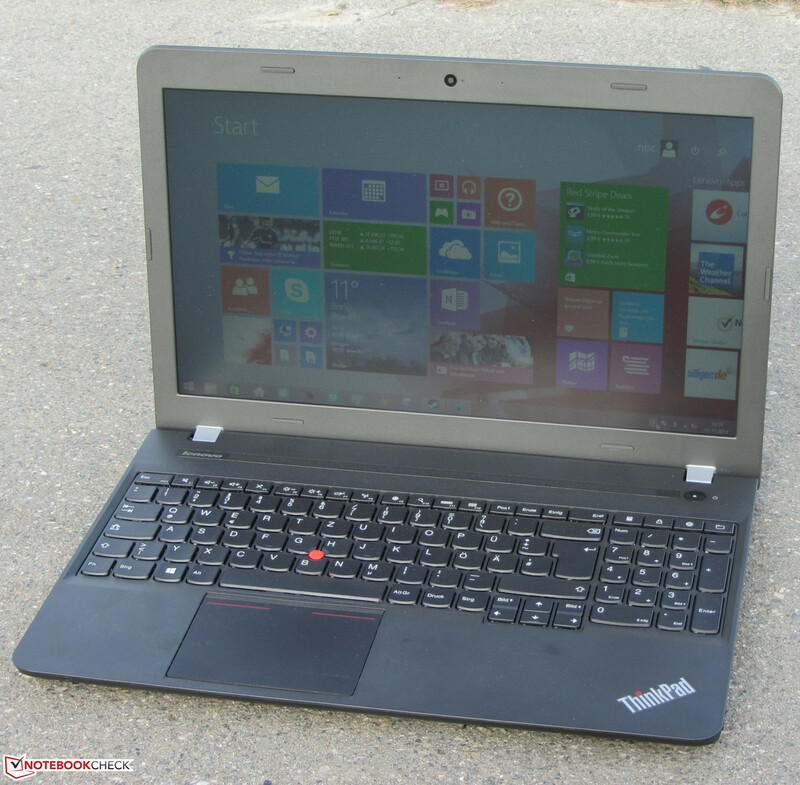 Can the ThinkPad E555 keep up with its predecessors or even surpass them? Our review gives the answer. Competitors for the ThinkPad E555 are all office notebooks with a price between 400 and 600 Euros (~$499 and ~$748) that are designed for private and business users. Examples would be the Acer TravelMate P255-M, Fujitsu Lifebook A544 and HP ProBook 450 or ProBook 455, respectively. 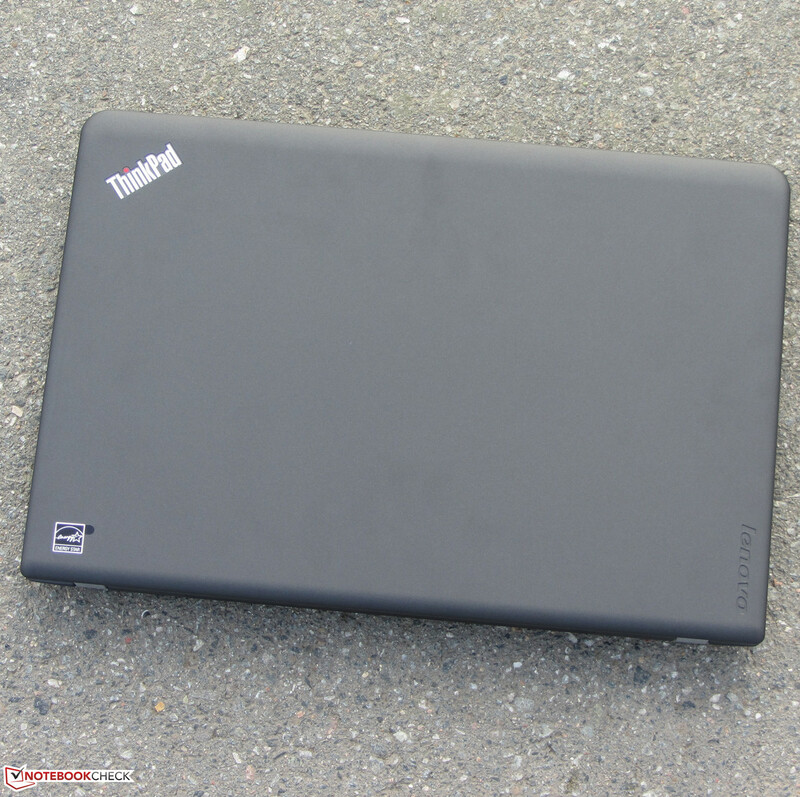 The ThinkPad E555 uses the same basic shape from its predecessors (ThinkPad Edge E545, ThinkPad Edge E535) and looks very similar. There are, however, many changes: The E555 is a couple of millimeters thinner than its predecessor. Furthermore, the case is not black anymore but the color is a very dark anthracite and the silver frame around the display is gone. Lenovo also replaced the glossy plastic between the keys with matte plastic - finally. The rubberized display cover was waived as well. Compared to the predecessors, the stability of the lid is now much better. 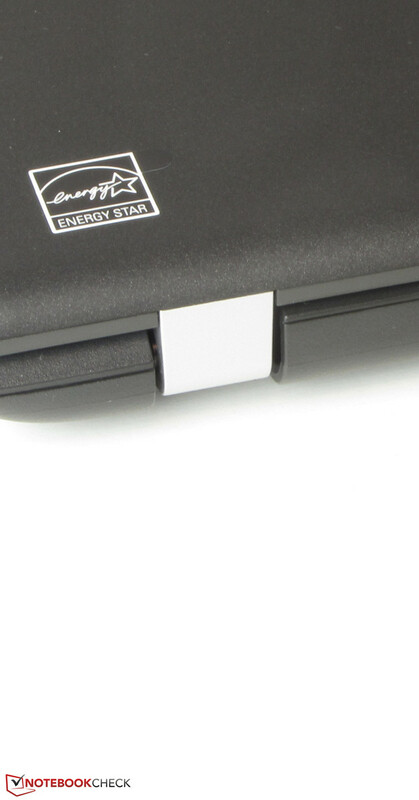 The battery is not integrated and the E555 still has two maintenance covers, just like its predecessors. The build quality of the device is decent and the stability meets the expectations for this price range. 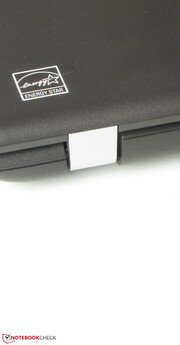 You can slightly dent the case underneath the touchpad, and the same applies for the area left next to the keyboard. Pressure on this area will let the right front corner rise from the surface. The torsion resistance of the base unit could be better as well. You notice that this is an inexpensive device. You can twist the lid as well, but there are no display distortions. The hinges keep the display well in position, but it bounces a bit. You can open the lid with one hand if you move it a bit. Contrary to the predecessors, the display cover isn't rubberized anymore. You can maintain and upgrade the device. 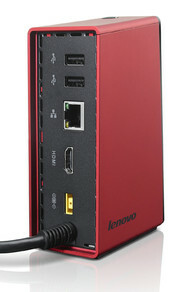 Compared to the predecessors, the port variety hardly changed, only one USB 3.0 port was waived. 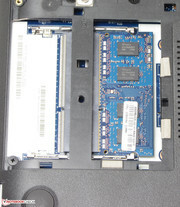 Rivals like the TravelMate P255 and the Lifebook A544 have almost the identical ports. 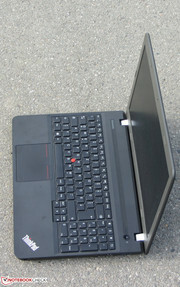 However, only the ThinkPad has a docking port (Lenovo OneLink). We don't like the port layout; the ports at the left side are very far to the front in the area of the palm rest. The front accommodates the card reader. 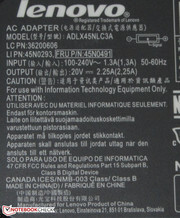 The communication modules of the ThinkPad are provided by the company RealTek. 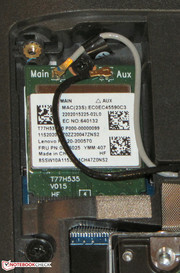 WLAN connections are provided by the RTL8723BE chip with support for the standards 802.11 b/g/n. We did not notice any signal issues, there were no dropouts in direct proximity to the router (around 3 meters) or two floors down. The Gigabit Ethernet chip (RTL8168/8111) is familiar and is used in countless notebooks. A Bluetooth 4.0 module is available as well. The integrated webcam creates a pale picture with a maximum resolution of 1280x720 pixels. Even though the device is designed for business customers, there are no security features like TPM or a fingerprint reader. The ThinkPad obviously comes with a quick-start guide with information about the security, warranty and the configuration of the notebook. Windows 8.1 (64-bit) is the preinstalled operating system ex-works. A Windows DVD is not provided. Alternatively, you can also install Windows 7 instead of Windows 8.1; Lenovo provides all the necessary drivers on its website. 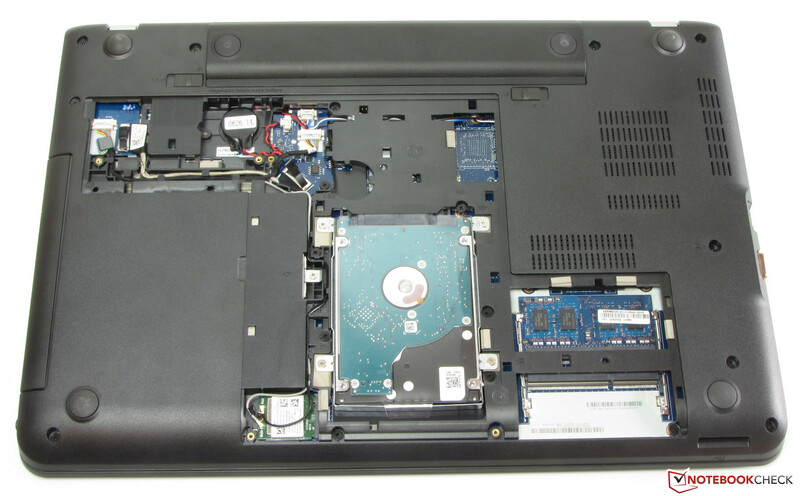 The ThinkPad has a large maintenance area that gives you access to the hard drive, the memory, the WLAN module and the BIOS battery. The notebook has two memory slots, but only one slot is occupied. 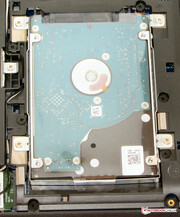 Replacing the hard drive is possible, but you can only use 2.5-inch drives with a height of 7 mm. You can even replace the BIOS battery if necessary. 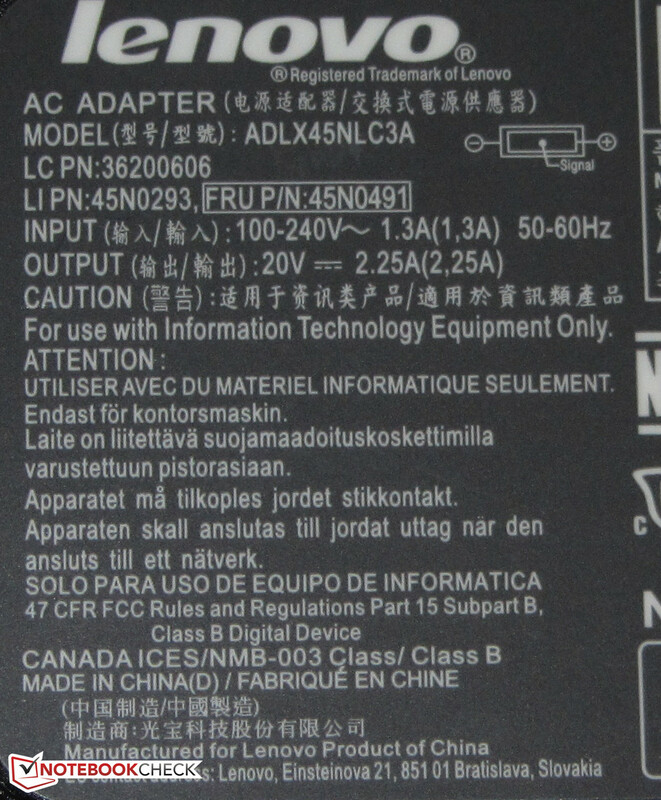 You also had access to the fan with the predecessors, but that is not possible anymore in the case of the E555. 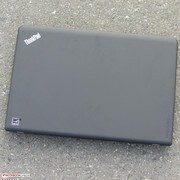 Lenovo only grants a one-year warranty for its ThinkPad, and that applies for the Lifebook A544 as well. Only Acer equips its TravelMate P255-M with a two-year warranty. Lenovo offers several warranty extensions for the ThinkPad. A three-year on-site warranty, for example, is available for 93 Euros (~$116). 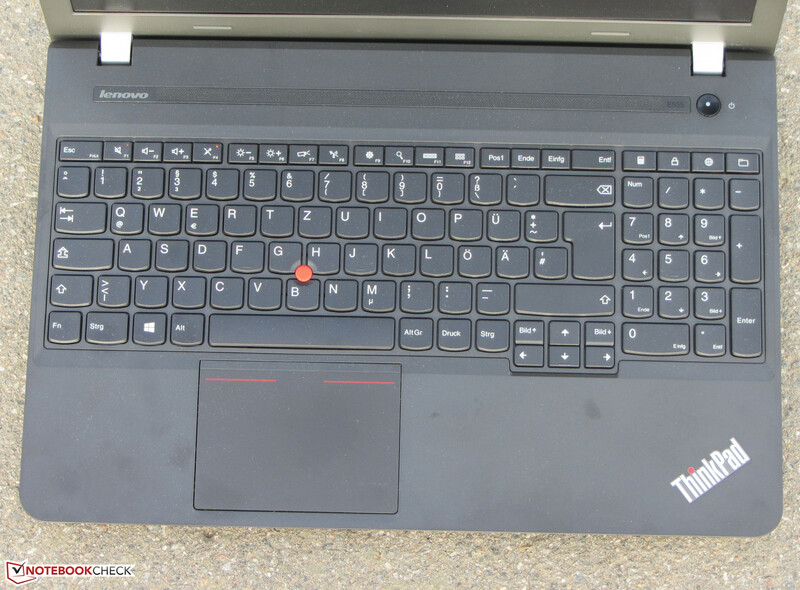 The predecessors of the E555 were equipped with very good keyboards, and this didn't change with the E555. It still uses the familiar AccuType keyboard from Lenovo, but there is no illumination. The keys have a slightly roughened surface and a concave curvature. All keys have a medium travel and a well defined pressure point. We also like the resistance. 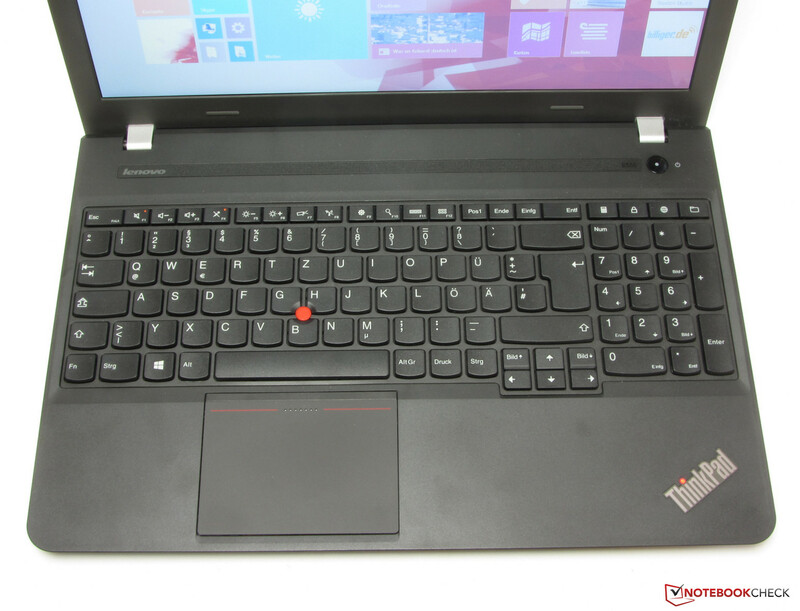 All in all, Lenovo offers a good keyboard that should also be convenient for frequent writers. 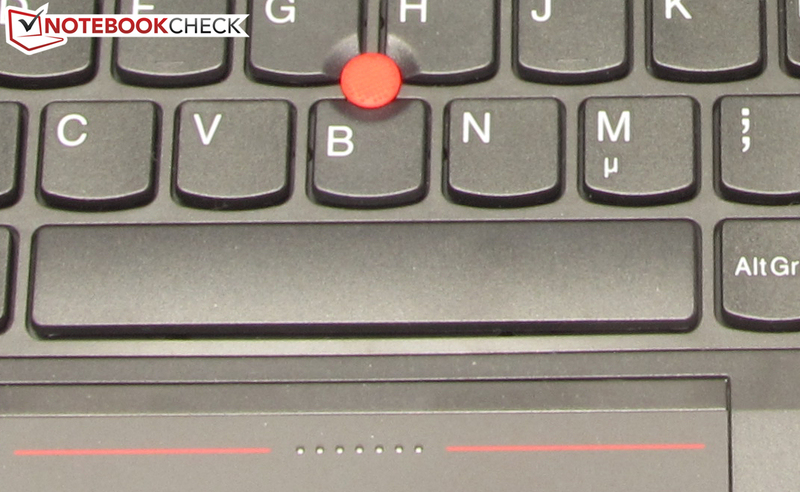 The latest generation of the ThinkPad E is equipped with a TrackPoint and a ClickPad as well. However, there is a small difference compared to the predecessors: The separate mouse buttons of the TrackPoint are gone. 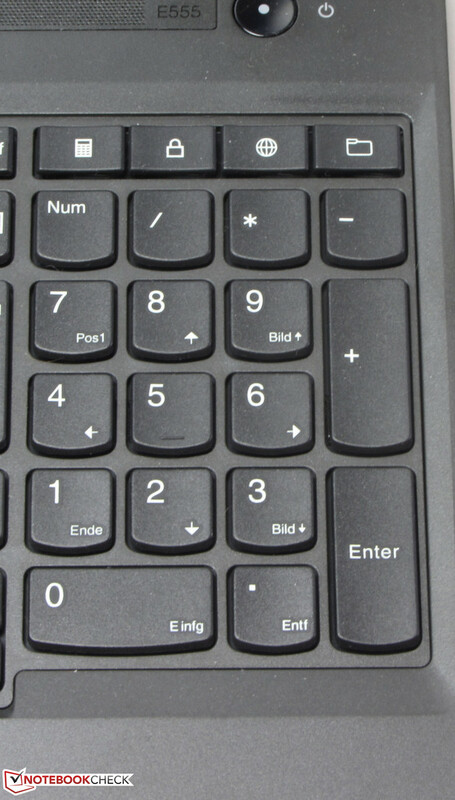 Instead, the top stripe of the ClickPad represents these buttons. The multi-touch ClickPad is roughly 10 x 7.5 cm. The smooth surface has good gliding capabilities and gestures are executed without problems. The pad has a short travel with a clear pressure point. The TrackPoint works without problems, allows the precise control of the cursor and you get used to it very quickly. ...you also get a TrackPoint. 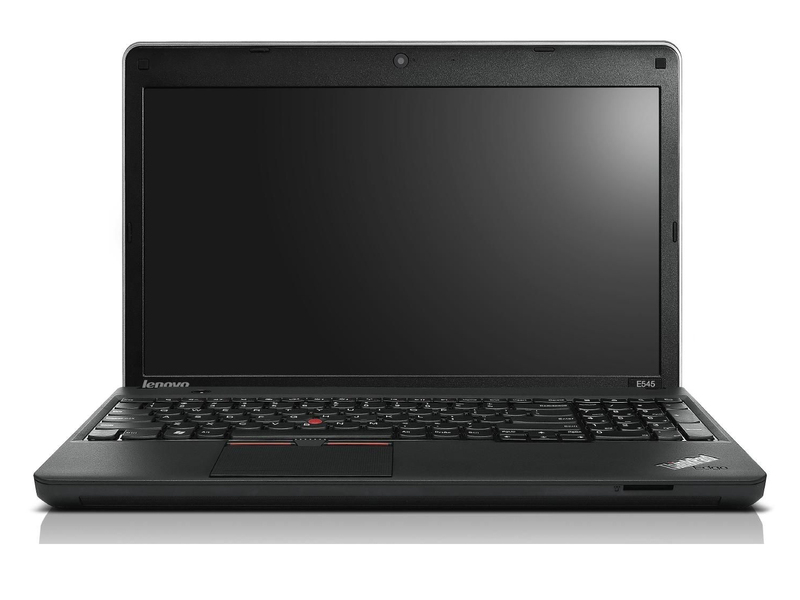 The ThinkPad E555 has a matte 15.6-inch display with a native resolution of 1366x768 pixels. The expectations are not very high when you buy a notebook for 449 Euros (~$560). 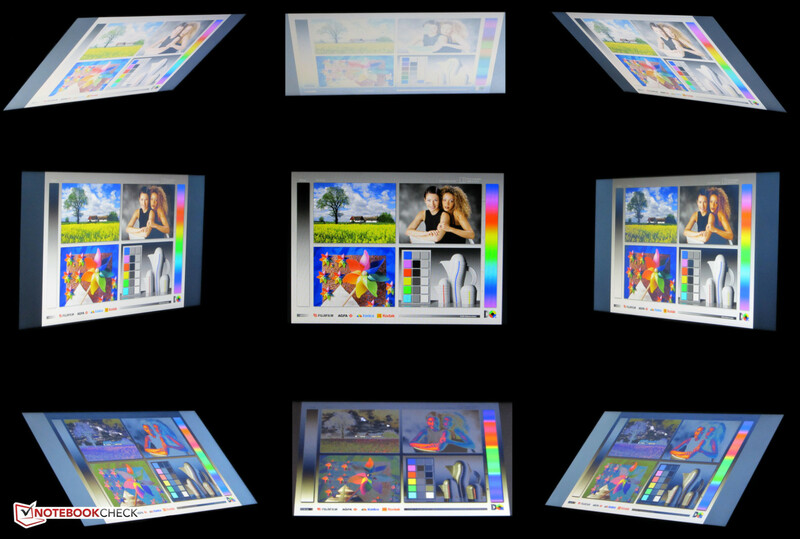 The display only manages a brightness of 209.3 cd/m², but we expect at least 250 cd/m². 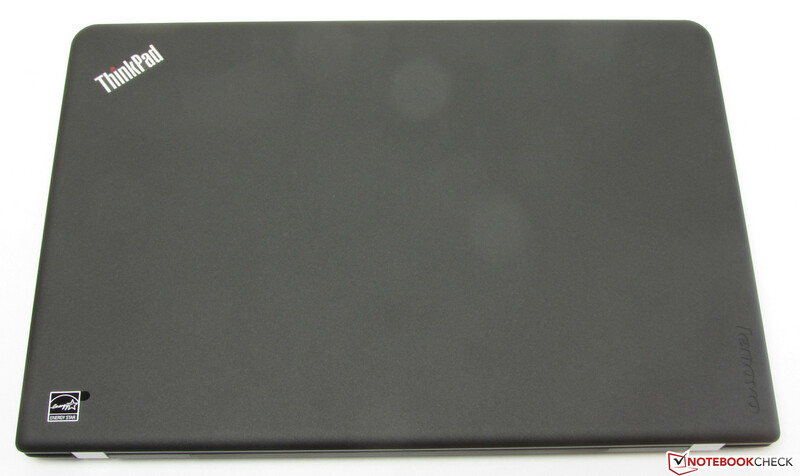 However, rivals like the Lifebook A544 (196.7 cd/m²) and the TravelMate P255-M (169.4 cd/m²) are even worse. Neither the contrast (312:1) nor the black value (0.65 cd/m²) of the panel are very good, but the results of the predecessors were even worse. 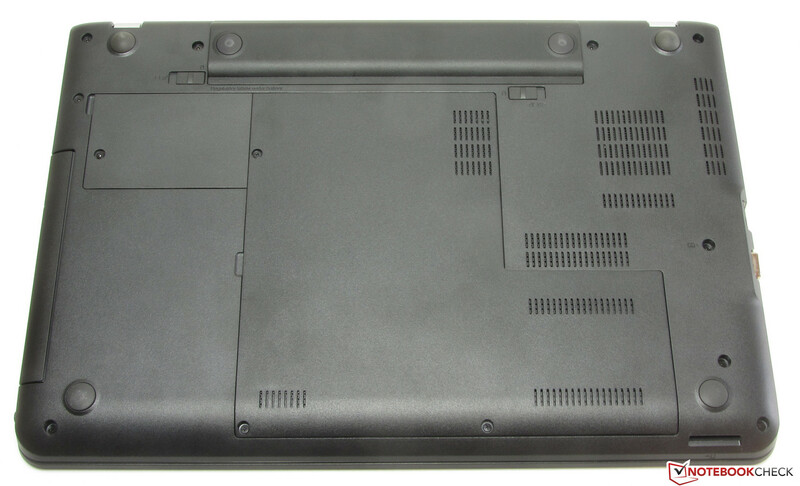 The same applies for the rivals like the Lifebook A544 (199:1; 1.06 cd/m²) and the TravelMate P255-M (266:1; 0.7 cd/m²). 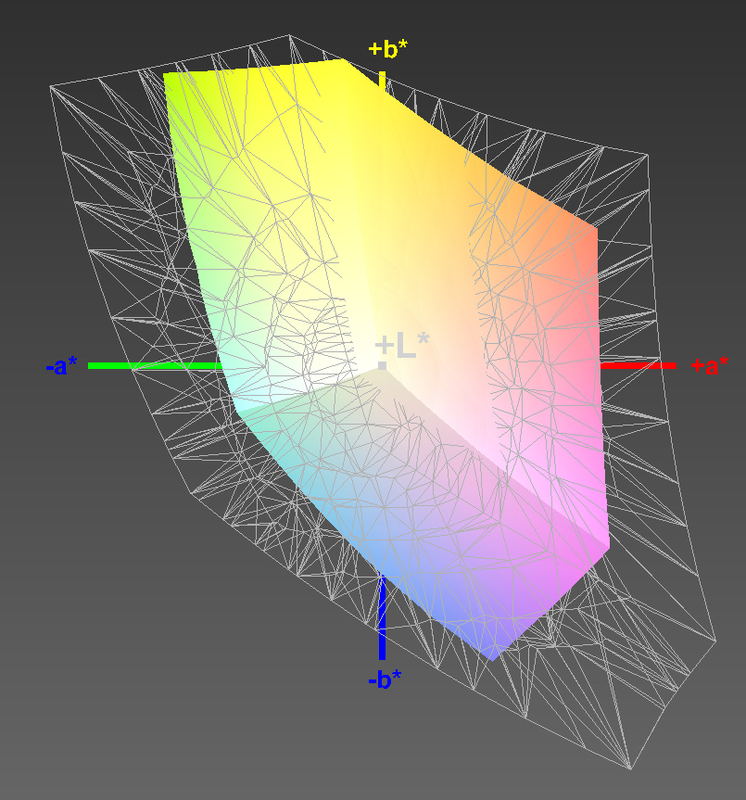 The AdobeRGB and sRGB color spaces are not covered by the ThinkPad display; our measurements show 56% sRGB and 39% AdobeRGB coverage, respectively. Out of the box the display shows a DeltaE 2000 deviation of 11.01. 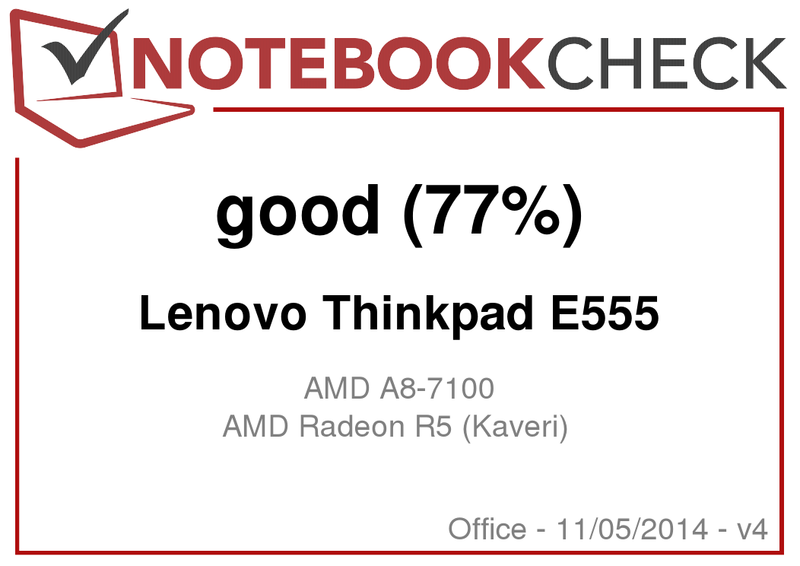 This is a normal result in the price range of the ThinkPad. The target would be a value smaller 3. The display has a blue cast. 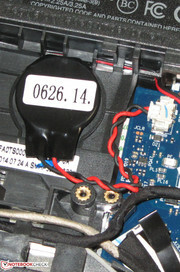 The ThinkPad has a common TN panel. The characteristic feature of this technology is the limited viewing-angle stability. 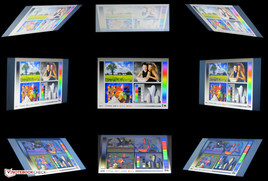 While the horizontal viewing angles are pretty big and multiple persons can easily look at the display, vertical shifts quickly result in picture distortions. Thanks to the matte display surface you can use the E555 outdoors. Lenovo's ThinkPad E555-series represents simple office notebooks for private and business users. The performance is sufficient for usual office and web tasks. Our review unit is available for around 450 Euros (~$561). At the time of writing there were only two other configurations, which are different in terms of the operating system. The version without Windows costs around 400 Euros (~$499), the version with Windows 7 Professional and Windows 8.1 Professional is available for around 550 Euros (~$685). 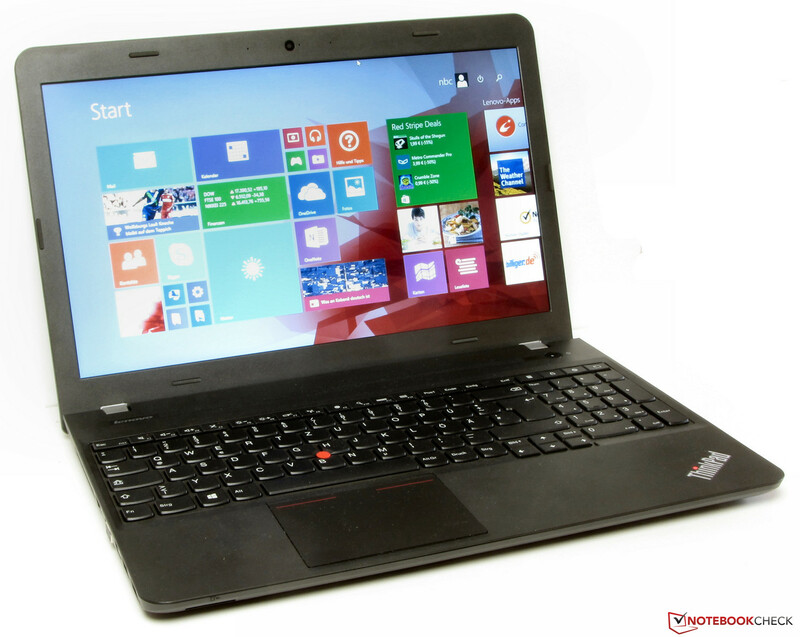 Lenovo equips the ThinkPad E555 with an A8-7100 APU from AMD based on the Kaveri APU generation. The CPU part of the APU is a quad-core processor with a nominal clock of 1.8 GHz, but the clock can be raised up to 3 GHz via Turbo. AMD specifies the TDP with 19 Watts, which means it is slightly above the Intel Haswell ULV processors (15 Watts). The test results of the processor are disappointing since it is not even close to its full performance. The Cinebench single-thread tests are executed with 1.8 up to 2.5 GHz, the multi-thread tests with 1.6 up to 1.8 GHz. The behavior is identical with mains and battery power. This means the performance of the AMD processor is clearly below the Intel Haswell ULV Core i3 processors. The theoretical performance with the maximum clock would easily be between Core i3 and i5 processors. The system runs smoothly and without stutters, which is not least a result of the fast hard drive. The PCMark 7 benchmark result is good. We could not determine a result for PCMark 8 because the notebook repeatedly froze in the middle of the benchmark. 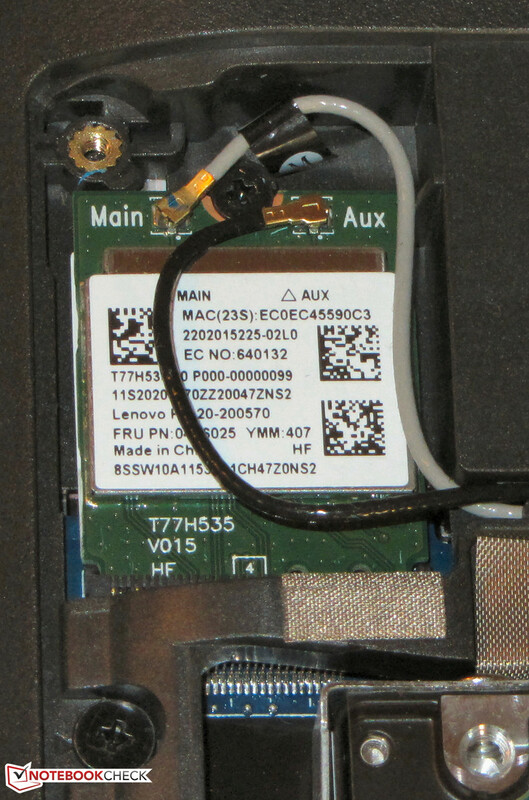 Lenovo equipped the ThinkPad with a hybrid hard drive from Seagate. It has a capacity of 500 GB and works with 7200 revolutions per minute. 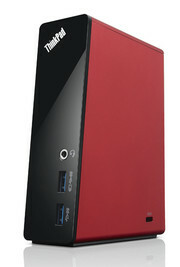 The hard drive also has an SSD cache (8 GB), which ensures a quick launch of frequently used applications. CrystalDiskMark determines a read speed of 141.2 MB/s and HD Tune shows an average transfer rate of 108.5 MB/s. These are good results for a hard drive with 7200 rpm. The drive is unfortunately pretty loud; accesses are clearly audible and easily surpass the fan. Many users are probably soon going to want a Solid State Drive. Besides the processor, the AMD APU also provides a Radeon R5 (Kaveri) graphics core. It supports DirectX 11.2 and runs with a clock of up to 514 MHz. The GPU is somewhere between Intel’s HD Graphics 4400 and HD Graphics 4600 in terms of performance. The latter can be raised with a second memory module. The memory will then run in a dual-channel configuration, which improves the GPU performance. 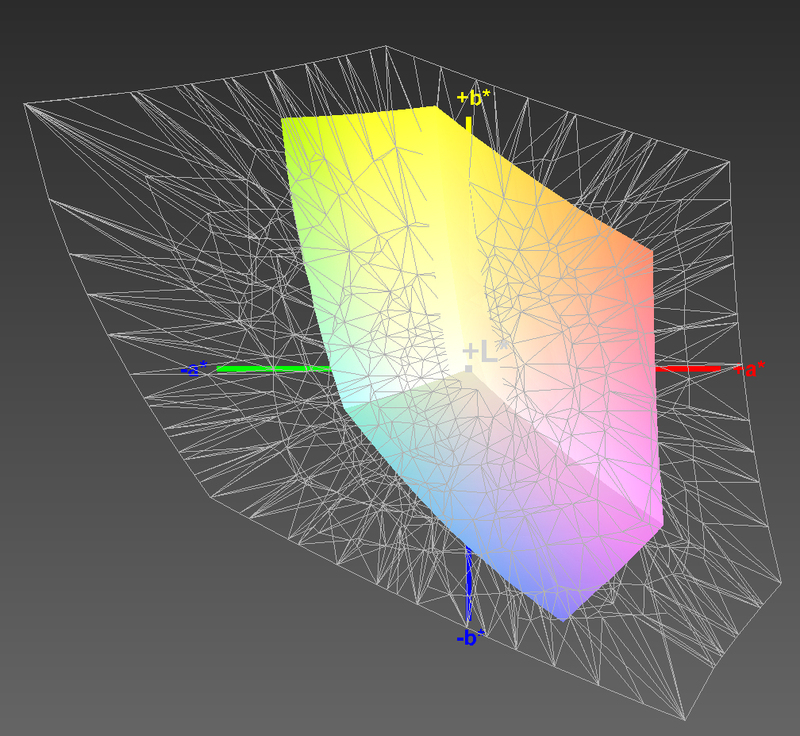 We tried it and were able to improve the 3DMark 2011 result by around 7.5% with 1,036 points. The ThinkPad was not designed for gaming. The AMD APU manages smooth gameplay in many titles with low resolutions and low or medium details. Similar to the 3DMark benchmarks, games benefit from a dual-channel memory configuration as well. With a second memory module and the activated dual-channel mode, the E555 manages higher frame rates. We tried this as well: The frame rates in Tomb Raider were increased by 27.6% on average to 46.7 fps (min), 32.1 fps (medium) and 16.4 fps (high). BioShock: Infinite shows an increase of 33.1% to 42.3 fps (min), 23.1 fps (medium) and 18.8 fps (high). This means the performance improvement during gaming is bigger compared to the synthetic benchmarks. You will have to pay a lot if you want a business notebook with gaming capabilities. One example would be the Acer TravelMate P255-MG (Core i5-4200U, Radeon R7 M265), which is available for around 700 Euros (~$872). The fan of the ThinkPad is pretty restrained in general. Maximum load (stress test, Prime95 and FurMark) only results in up to 37.9 fps – a very moderate value, and the fan is often completely deactivated when idling. Still, the device is far away from silent in these scenarios. The reason is the hard drive. Lenovo used a very fast model, but every access is clearly audible in return. The stress test (Prime95 and FurMark for at least one hour) results in a processor clock of 1.1 GHz, both on mains and battery power. The GPU fluctuates between 280 and 380 MHz on mains power during the stress test with occasional spikes, but the GPU is throttled to 281 MHz on battery power. Since the CPU and GPU are heavily throttled, the ThinkPad gets hardly warm. All the surface temperatures stay below 40 °C, even during the stress test. The Lifebook A544 is a bit warmer, but it is also equipped with a common mobile processor. The TravelMate P255-M, however, is the coolest device within the comparison. 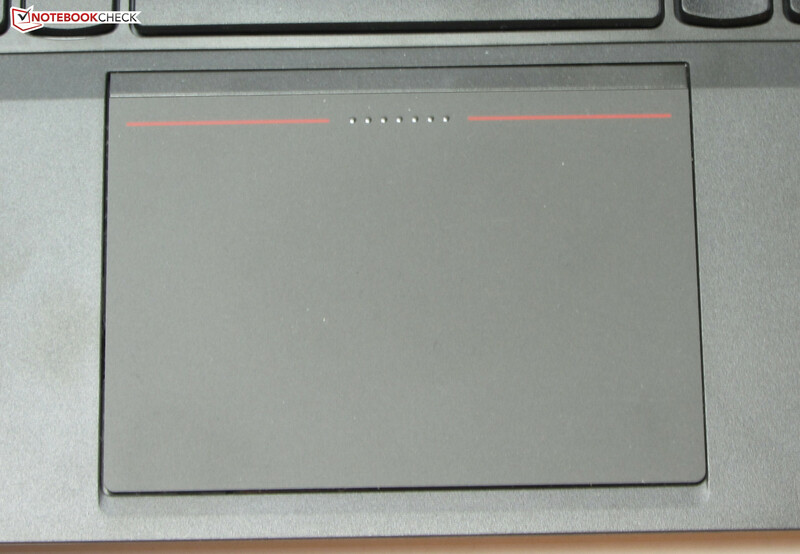 The stereo speakers of the ThinkPad are located above the keyboard behind a perforated cover. They create a pretty decent sound, but bass is missing. Voices are easy to understand. However, you don’t want to listen to the speakers for longer periods, a better experience can be realized with headphones or external speakers. 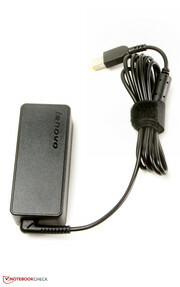 The power adaptor of the ThinkPad has a nominal output of 45 Watts, which means the device does not consume very much power. The consumption is between 10.9 and 14.3 Watts while idling, which aren’t really good values by today’s standards. 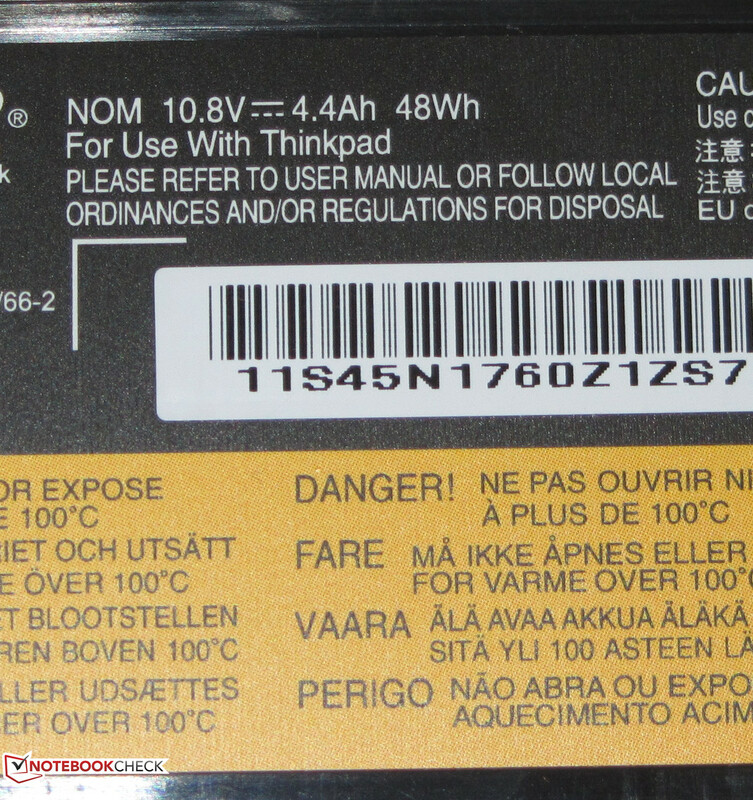 Notebooks with Haswell ULV processors are usually below 10 Watts. One example would be the TravelMate P255-M. The situation is similar with medium (3DMark06 running) and high workloads (stress test, Prime95 and FurMark running), where the ThinkPad (34.1 and 41.5 Watts, respectively) cannot keep up with the TravelMate. 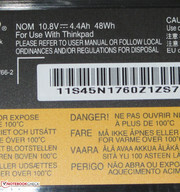 The battery of the ThinkPad manages an idle runtime of 6:44 hours, the TravelMate is slightly behind. We simulate the idle conditions with the Battery Eater Reader’s Test, which uses the lowest display brightness while the energy-saving features are activated and all the wireless modules are deactivated. Load results in a runtime of 1:31 hours for the E555, the TravelMate is once again not as enduring (1:12 hours). 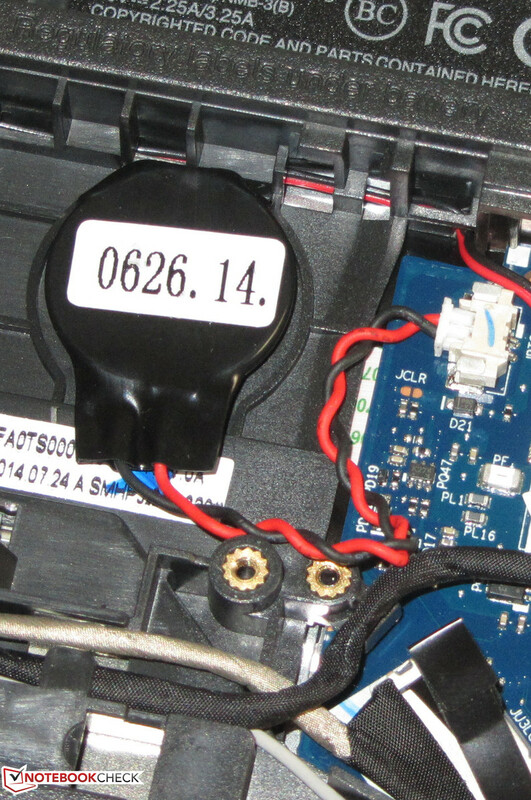 We determine the runtime under load with the Battery Eater Classic test. The display brightness is at its maximum level while the high-performance profile and all the wireless modules are active. 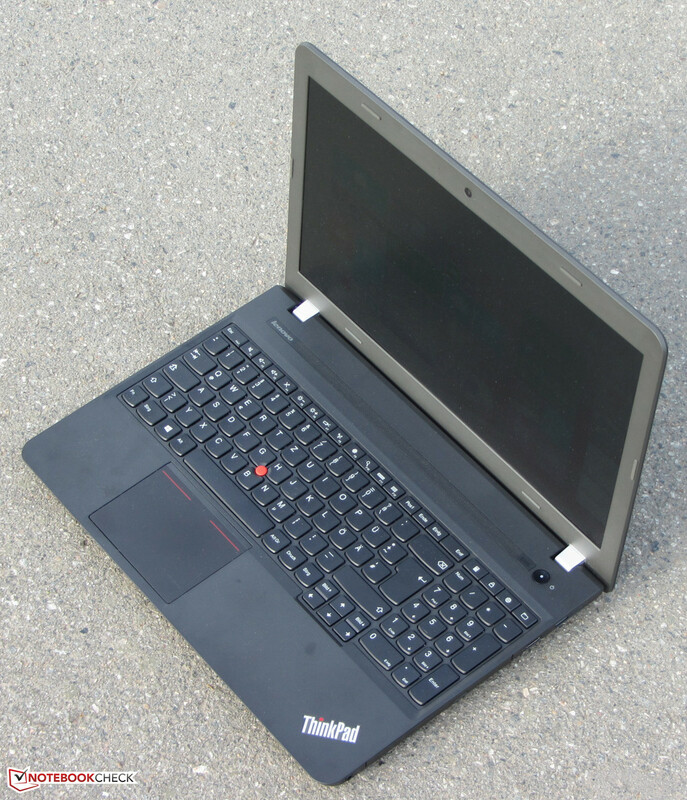 The ThinkPad lasts for 3:58 hours in our WLAN test. Both the TravelMate (5:09 hours) and the Lifebook (6:50 hours) manage much longer runtimes. This test uses a script that automatically refreshes websites every 40 seconds. The energy-saving profile is active and the display brightness is adjusted to around 150 cd/m². We check the video playback runtime with a loop of the short movie Big Buck Bunny (H.264, 1920x1080 pixels). The energy-saving mode is active and the display brightness is adjusted to around 150 cd/m². The ThinkPad lasted for 3:13 hours. 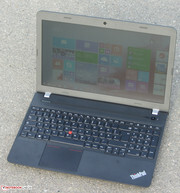 Overall, the runtimes of the ThinkPad are not really impressive. Considering the battery capacity (48 Wh), the device should manage much longer results. The faster Lifebook A544 manages almost 3 hours more in the realistic WLAN test, despite the almost identical battery capacity (49 Wh). Lenovo’s ThinkPad E555 is a simple office notebook for private and business users. The performance is sufficient for office and web applications. It does not get very warm in operation and could be very quiet – if you replace the loud hard drive. Similar to the predecessors, the input devices can once again convince us. The number of ports can be extended with a docking station. The matte display won’t win any prizes, but it is still just okay for this price range. The battery runtimes are not very good. 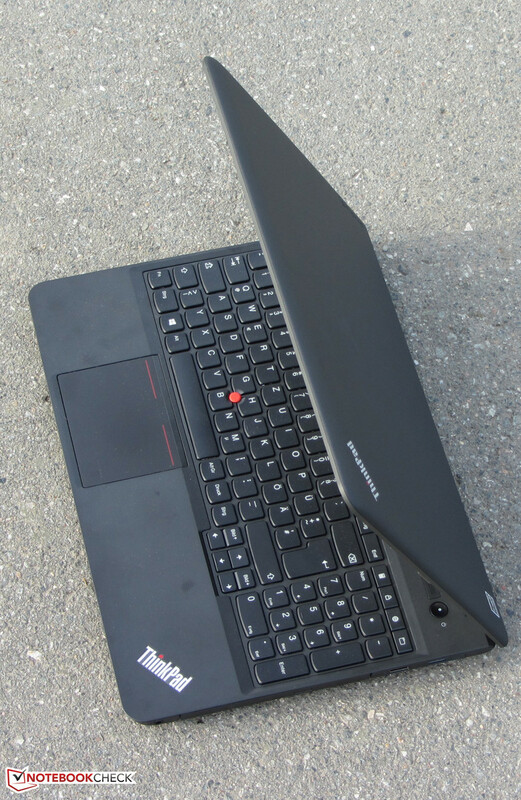 Compared to its predecessors, the ThinkPad E555 is a bit disappointing since we cannot really see any advancement – sometimes the contrary. 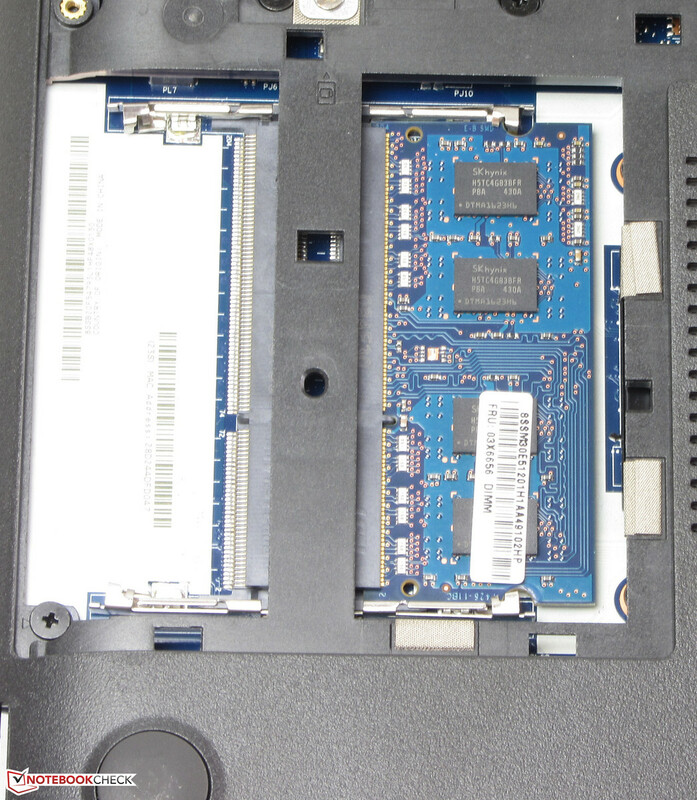 Both the ThinkPad Edge E535 as well as the ThinkPad Edge E545 offered more CPU performance than the E555. The battery runtimes are also shorter, even though the battery capacity is similar. The Acer TravelMate P255-M offers significantly more CPU performance compared to the ThinkPad, but it is also 50 to 100 Euros (~$62 to ~$124) more expensive. The Fujitsu Lifebook A544 surpasses both rivals in terms of performance and also manages the best battery runtimes among our three comparison devices. This notebook is also around 100 Euros (~$124) more expensive than the ThinkPad. The ThinkPad has very good input devices. 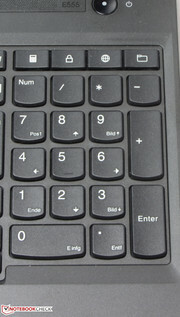 A numeric keypad is available. The DVD burner reads and writes every kind of CD and DVD. You can maintain the notebook. The device has two memory slots. You can replace the hard drive. Good: The notebook has two WLAN antennas. Even the BIOS battery could be replaced. The battery weighs around 291 grams. ...and has a nominal output of 45 Watts. The low temperatures of the case and the good keyboard. A brighter panel with a higher contrast and longer battery runtimes. The processor cannot use its full performance, but without an apparent reason. Fujitsu Lifebook A544, Acer TravelMate P255, HP ProBook 455, Dell Latitude 3540, HP ProBook 450, Lenovo ThinkPad Edge E545, Lenovo ThinkPad Edge E540, Lenovo ThinkPad Edge E535, Lenovo ThinkPad Edge E530.